5 oz./bag . 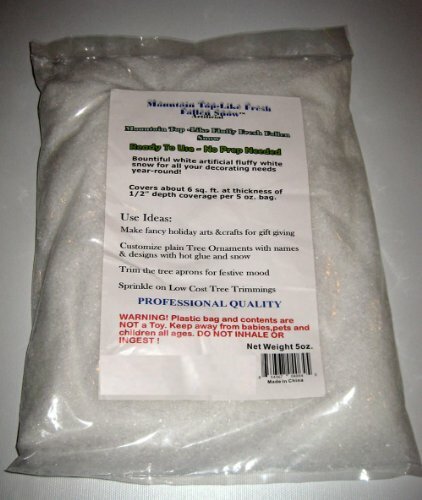 Bring a white Christmas all year -round inside with Mountain Top-Like Fluffy Fallen Snow (Tm) artificial snow. Looks and falls just like real snow, but it's not cold and doesn't leave a mess! Beautiful white artificial fluffy white snow for all you decorating needs year-round. 5 oz./bag/Package size: 12" X 10" X 1.75"
If you have any questions about this product by Mountain Top-Like Fluffy Fallen Snow, contact us by completing and submitting the form below. If you are looking for a specif part number, please include it with your message.